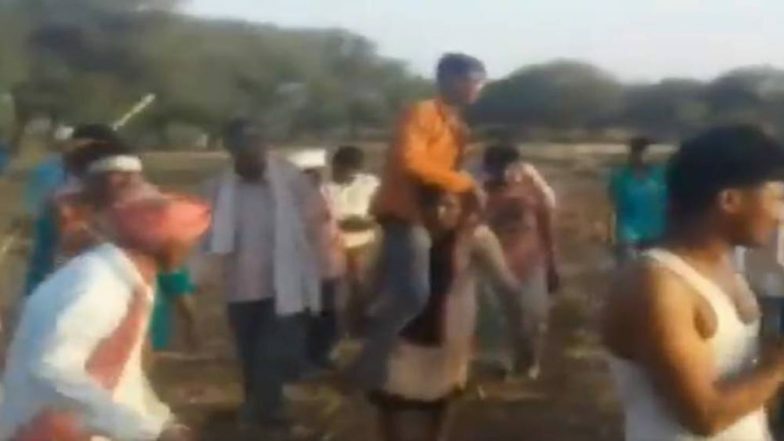 Jhabua, April 14: In an unusual incident reported from Madhya Pradesh, a woman in Devigarh village in Jhabua district was forced to carry her husband on her shoulders as punishment for allegedly having an affair with a man belonging to another caste, reported news agency ANI. A case has been registered after the video went viral on social media platforms. Crime Against Women & Senior Citizen May Bar You From Applying For Government Jobs & No Passport Will Be Issued. In the clip, the woman can be seen carrying her spouse on her shoulders as the villagers mock her whenever she slows down. The woman, appearing in her early twenties, is surrounded by tens of people. Crime Against Women And Children in India: The Sad Story of Selective Anger, Religion And Politics. Some are shouting, some hooting her plighting and others dancing. Some people are also recording the incident on their mobile phones. Others armed with sticks. Crime Against Women: 12750 Cases of Crime Against Women in Assam in 2017–2018, Says Government. Vineet Jain, Jhabua Police Superintendent speaking to news agency ANI said that two people have been arrested so far in the matter. "Some people in a group disrespected a woman in Devigarh, Jhabua. A case has been registered against all of them and 2 people have been arrested so far," he said.